The W London - Leicester Square brings hip and fun to the very heart of London's West End. The hotel has 9 suites of which 2 are called WOW suites and 1 Extreme WOW suite all with custom made furnishings. The hotel actually starts from the first floor of the building while on the ground floor is Europe's first M&M store with 35,000 sq feet of floor space (opens summer 2011). Bedrooms are designed to give a sense of energy with a vivid style and equipped with the best of modern tech and custom made furniture. Little extras include items such as a Munchie Box. Each room has Bliss® sinkside six to soothe the senses and floor-to-ceiling windows . Amenities include a 37'' flat screen TV, individual climate control, IPod docking station, DVD player, dual line telephone with voicemail, ironing facilities, safe and high speed internet access (charges apply). Bathrooms come with a hairdryer, top brand toiletries, rainforest shower and bathrobes. Beds have a feather-top mattress, 300 thread-count Egyptian cotton sheets and goose-down comforter. You even get your very own pillow menu. Doors can be opened via smart phone. Spectacular Room: These are on the upper floors, views over Wardour Street and Soho. Fabulous Room: On the highest floors, views of Wardour Street and Chinatown. Wonderful Room: Views of Soho. 24 hour room service. Turndown service. In-room massage treatments available. Lift access to each floor. All suites get access to the Mega Bar, a luxurious in-room bar service complete with personal mixologist, sound system and disco ball. Measuring 2.4m x 1.6m the Mega Bar is wheeled into suites and offers the services of one of W Londons bar team. Dining/Drinking There is also a stylish cocktail bar, the Wyld Bar with its ruby glow. Featuring an oversized rotating mirror ball, ruby lighting and live DJs. Located on the first floor. The W Lounge restaurant and bar serves cocktails and snacks in intimate surroundings. The place for high tea and classic British dishes. DJ's Thursday thru Saturday. Closed on Monday for private functions. Lounge at the W London: A wide open animated space space, relaxing during the day, buzzy at night. The lobby lounge where high tea is served. Options include a regional assortment from the finest tea specialists as well as classic British dishes with a special W ingredient. Adjacent is the Lounge Bar where signature W cocktail are served. Open: 06.00 till 02.00, W2Go: 06:00 till 11.00., Afternoon Tea: 14.00 till 17.00. Cocktails/Full Bar Service: noon till 02.00. Spice Market: Located on the ground floor and mezzanine level. Fine dining restaurant. Southeast Asian sensuality and regional dishes in an informal and sultry atmosphere and inspired by south east Asian street food. The food arrives continuously throughout the meal and is placed in the centre of table for all to share. Dishes include regional curries, fish sauces and spices, Spiced Chicken Samosas with Coriander Yogurt, Cod with Malaysian Chilli Sauce, and Pork Vindaloo. Breakfast served 07.00 till 11.00 (weekends 08.00 11.30), lunch and dinner noon till 23.00. The W Hotel Leicester Square has its own SWEAT® Fitness Centre which is a fully equipped gymnasium. Also onsite is the 'AWAY Spa'. The spa has treatment rooms, a beauty boutique/bar, detox/relaxation area, a sauna and steam rooms. Spa open every day 09.00 till 21.00.
a (Writers bar has been installed in the lounge. This is the W Hotels own take on a hotel library. This is the creation of Scotsman Damian Barr. Ten writers from the USA and UK have chosen their 10 essential books (for a total of 100) along with a handwritten note explaining what it means to each of them inside each book. There's both a 24 hour reception and 24 hour concierge desk. 4 meeting rooms cover a total space of 2,400 sq feet. The hotel has its own private screening room with 37 seats. Wireless internet access can be picked up in all areas (charges apply). 24 hour reception desk. Luggage storage available. Non-smoking throughout. Nearest: Tube Station: Piccadilly Circus 211 yards (192 metres), Railway Station: London Charing Cross 0.4 miles (0.6 km), DLR Station: Tower Gateway 2.5 miles (4 km), Motorway: M1 Junction 1 6 miles (9.7 km). Within a 0.5 miles (0.8 km) circle of the hotel are 5 tube stations (underground system). The W Hotel and Residences London Leicester Square hotel enjoys a really prime location in the heart of London's West End. Actually between Leicester square itself and the area of Soho. Both areas are known for their thriving night life, restaurants, bars and clubs. Soho additionally enjoys a reputation for its adult oriented clubs and world famous restaurants. Within the vicinity of the hotel lies London's theatreland with the 9 major theatres within 300 yards. The Prince of Wales theatre being just 50 yards from the hotel. 2 tube stations within 250 yards (see locality information). Places of interest locally are way too numerous to mention all but a selection include Planet Hollywood (0.11 miles), Trocadero Centre/Ripley's Believe it or Not Museum (0.13 miles), Haymarket Sports bar (0.19 miles), the National gallery (0.19 miles) and Trafalgar square (0.23 miles). Below the W hotel is the largest M&M store in Europe covering 35,000 square feet and spread over 4 floors. Milesfaster ranking: 389th from 866 London hotels, and 111st of 131 five star rated hotels. Another to Consider: A similar type of hotel (size, rating) nearby (0.1 miles, 0.1 km) would be the 5 star Radisson Blu Hampshire Hotel, whose lowest rates start at about £204 and which has an 89% guest satisfaction rating. The Radisson Blu Hampshire Hotel also offers: free WiFi. We can also point you towards a lower price option, the Grange Holborn Hotel. 0.7 miles from the W Hotel London Leicester Square (1.2 km), achieving a rating of 81% by its past clients with base rates starting at about £111 (theres free WiFi too). Looking for something near by with a solid past guest score? In that case the 5 Star Haymarket Hotel seems like it might fit the bill. The Haymarket Hotel is only 0.2 miles (0.3 km) away. The Haymarket Hotel has a perfect unblemished customer rating 99%, a truly stunning achievement. 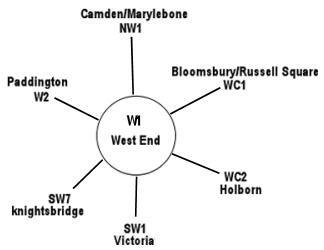 The 50 nearest hotels around this area (10 Wardour Street, W1 postcode) which we have have on our website extend out to a 0.5 miles (0.9 km) radius. The numbers by star rating are 28 five star hotels (average rating 88%), 16 four star hotels (average rating 88%), 6 three star hotels (average rating 84%) and 1 two star hotel (rated 80%). Coming out as the top rated hotels are Haymarket Hotel (5 star), the Soho Hotel (5 star), the Covent Garden Hotel (5 star) and the Corinthia Hotel London (5 star) (all 4 are joint top with 99%). Of the nearest fifty one hotels we have base rates for all of them. Looking at all hotels in the area the average base rate is £218 per night. They range from a low of £18 at SoHostel (2 Star, 80%) up to £505 at Ritz Hotel London (5 Star, 90%). Rates break down to the following for each star rating: Five Star average: £287, Four Star average: £153, Three Star average: £102 and Two Star average: £18. Using our in-house algorithm we rank hotels based on guest ratings and weighted for related factors. We have a ranking for W Hotel London Leicester Square 42nd (joint) of 50 and 23rd (joint) for the 28 five star hotels in the area. Our base rate rank for the hotel is 35th of 51 (12th of 28 five star hotels.). We use the base rate ranking and review ranking for the hotel to get an overall ranking of 45th of 48 for sheer value for money (SoHostel was top). The W Hotel Leicester Square hotel is built on the site of the old Swiss Centre which was built in 1962 and demolished in 2008. The hotel was constructed at a cost of some £200 million pounds by contractors McAleer & Rushe following a design by Jestico + Whiles. The hotel is within a 19,500m2 complex which includes 9,300m2 of retail space at ground level and a 2,300m2 health and leisure club in the basement.